Having been part of the PokerNews Live Reporting team and the World Poker Tour live updates team for a couple of years, I have been fortunate enough to see a number of great WPT tournaments in Europe. I was there when a young goat farmer (Miha Travnik) became WPT Slovenia champion, watched Matt Waxman become the first American winner of a European WPT Main Event, and reported on Andrey Pateychuk adding the WPT Prague Main Event title to his resume less than two months after he won EPT San Remo. 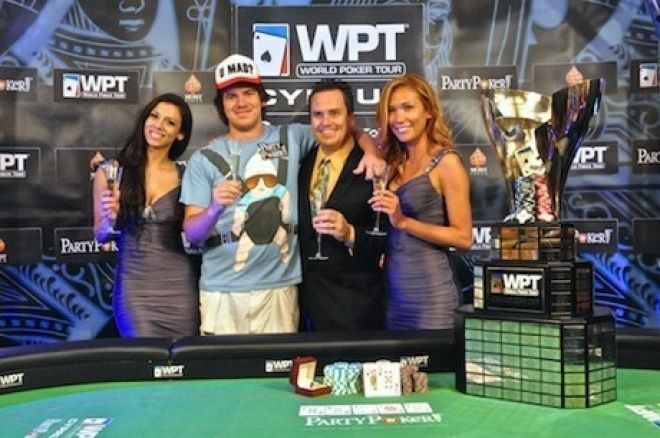 But on Thursday Aug. 9, 2012, I witnessed one of the greatest poker achievements of all time when Marvin Rettenmaier won the WPT Merit Cyprus Classic to become the first player in the long history of the WPT to win back-to-back WPT Main Events. Rettenmaier first appeared on the poker radar in December 2009 when he finished runner-up to Payman Mahourvand in the €1,500 Main Event of the Christmas Poker Festival held in Wisbaden, Germany. Over the next 12 months, Rettenameir made it into the money in a staggering 18 major live tournaments around the word for combined winnings of $510,362. The highlights of these cashes included a final table appearance in a $1,500 no-limit hold'em tournament at the 2010 World Series of Poker, a third place finish in the €3,000 Partouche Poker Million in Madrid, a runner-up finish in the Marrakech Poker Open (which netted him a then career best of $73,880), his first outright win in a €1,000 event at the Nova Gorica leg of the 2010 Italian Poker Tour and his second career victory when he bested a 120-strong crowd in the Spanish Poker Tour Grand Finale. These superb results and Rettenmaier's willingness to travel the world to ply his trade led to a lucrative sponsorship deal with Titan Poker, a deal that allowed him to travel the world playing poker. By the end of 2011, the Stuttgart-born pro had cashed a further 25 times, winning $827,953 in the process; including a career-best score of €244,036 ($332,470) that he was awarded for winning the French Poker Series Finale in February 2011. Rettenmaier and Titan Poker parted company in May 2012 and the 26-year old was snapped up by the online poker giant that is PartyPoker. The ink was still wet on his new contract when Rettenmaier entered the $25,000 WPT World Championship event at the Bellagio, Las Vegas; the grand final of Season X of the WPT. Eight days later, Rettenmaier bested a star-studded final table that was also the home to Steve O'Dwyer and Michael “The Grinder" Mizrachi to win the massive $1,196,858 first-place prize. Over the summer, Rettenmaier cashed in six WSOP events, including a making a final table appearance in the $5,000 No-Limit Hold'em Mixed Match (he finished fifth) and a 684th place in the Main Event before he returned to Europe to participate in the WPT Merit Cyprus Classic. Rettenmaier entered on Day 1a and managed to triple his 30,000 starting stack into a healthy 90,000 chips. Day 2 went even better for him as he bagged up 251,000 chips at the close of play. Day 3 saw Rettenmaier have to dig deep as he endured a frustrating time at the tables, ending the day with 212,000 chips, placing him 15th out of the 18 surviving players. It obviously worked because toward the end of the penultimate day's action, Rettenmaier ran extremely well and ended the day with 2,020,000 chips, placing him third in chips at the six-handed final table. His stack was bolstered when his beat the of Walid Bou Habib when the board ran out and then he sent Erik Cajelais to the rail in seventh place when Rettenmaier's prevailed against Cajelais' despite the Canadian having a plethora of outs by the turn of a board that read . The on the river busted Cajelais and the final table was set. It would be fair to say Rettenmaier was the most talented player at the final table and he went into it full of confidence. Before taking his seat he was talking to the PokerNews Live Reporting Team where he played down the fact he had made back-to-back WPT final tables but said he was “just a small sit 'n' go away” from victory. The final table was a cagey affair, with the players seemingly happy to fold their way to a higher payout. We remarked among each other that the higher the blinds got the less of an advantage Rettenmaier would have. He obviously realized this and started to take matters into his own hands. First he sent Kiryl Radzivonau to the rail in sixth place, Rettenmaier's pocket queens more than enough to beat Radzivonau's . Then a couple of hours later, with the blinds and antes really starting to bite into the players' stacks, Joseph El Khoury moved all in with and Rettenmaier snapped him off with a dominating . From that point on Rettenmaier never looked back and accumulated chips with easy. First Victor Paraschiv three-bet all in over the top of a Rettenmaier opening raise with just only to discover he was being crushed by Rettenmaier's . Shortly afterward, Rettenmaier put his two remaining opponents all-in while holding and Ran Azor made the call with pocket sevens. Rettenmaier caught a queen on the river to send the tournament into the heads-up stage. Going into the one-on-one battle Rettenmaier held a massive 4:1 chip lead over Artur Voskanyan and it only took him two hands to push home this advantage. On the second hand of heads-up play, Rettenmaier put Voskanyan to the test for all his chips. Voskanyan called and revealed while Rettenmaier flipped over . Rettenmaier paired his nine on the flop and when the turn and river were the and , respectively, Rettenmaier had done the unthinkable and won back-to-back WPT titles; the first player in the history of the WPT to do so. As soon as Rettenmaier's victory was confirmed, he was swarmed by friends and the media all wanting to get a glimpse, take a photograph, and ask him how it felt to become the first player to win back-to-back titles. "I feel amazing!" an overwhelmed Rettenmaiers said. "I wanted this so bad and to actually do it is just...amazing!" That was all we could get out of Rettenmaier before he was whisked away and asked to pose for scores of photographs. However, Rettenmaier did find time between glasses of champagne and snaps of shutter lenses to talk to our very own Lynn Gilmartin. After writing themselves into the poker history books, most players would be happy to kick back and relax for a few weeks to take in everything they had just achieved, but Rettenmaier is not most players. After a night of celebration, Rettenmaier jetted from Cyprus to Pennsylvania to play Day 1b of the WPT Parx Open Poker Classic.